From MEDICOM Toy. Heath Ledger justly earned an Academy Award for his chilling portrayal of The Joker in Christopher Nolan's acclaimed film, The Dark Knight. Medicom revisits Ledger's Joker with their new The Dark Knight Miracle Action Figure, one of the most detailed figures on the market and available exclusively through PREVIEWS! 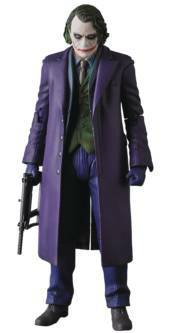 Standing just over 6' tall, this chilling reproduction of the sinister master criminal from The Dark Knight includes alternate heads and hands, plus a full arsenal of weapons to recreate many of his signature moments from the film! This version features all new 3D printed head sculpts and new accessories!